The St. Joseph Historic Lighthouse and catwalk, located on the city's North Pier, was erected at the mouth of the St. Joseph River in 1832. It was one of the first two lighthouses built on Lake Michigan. In 1859, a replacement lighthouse was built on the bluff. The tower and beacon were constructed first. The keeper's house was built around it later. That beacon was replaced by range lights after the north and south piers were built in 1907 and 1919, respectively. 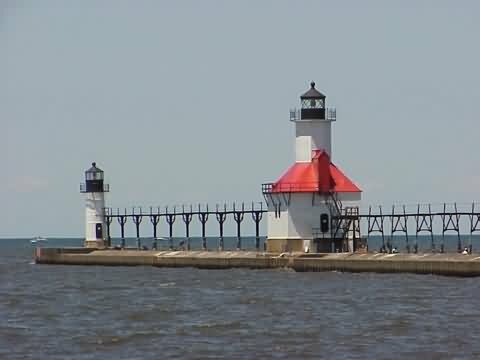 St. Joseph and Grand Haven boast the only remaining two-pier range light systems with both towers and catwalks intact. In 1938, the U.S. Coast Guard assumed responsibilities for navigation warnings signals and marine safety, absorbing the lighthouse services. The original St. Joseph lighthouse with tower and beacon was torn down in 1955. The current lighthouse replica was constructed later on the North Pier. Both the North Pier and the South Pier, which house the range lights, are publicly accessible. In 1995, the current North Pier lighthouse was featured by the U.S. Postal Service in a series of commemorative Great Lakes Lighthouse stamps. (if coming from the south) Take I-94 north to I-94 Business Route. Follow I-94 Business Route for 6.2 miles into St. Joseph. At the lights where I-94 Business Route goes right and Route 63 goes straight, continue straight on Route 63. Take Route 63 over the bridge and take your first left. Follow that road to the end where it will meet with Upton Drive. Stay on Upton Drive for 0.3 miles then take a hard left onto Marina Drive. Take Marina Drive for 0.3 miles then turn left on Ridgeway St.
Go 0.2 miles to the end of Ridgeway and take a right onto N. Pier Rd. From there you can walk to the lighthouses.